Vikram Kumar, InternetNZ Chief Executive opened the NetHui by reminding us how much things has changed over a very short time. The Internet used to be the sole domain of geeks, they’d do things there which didn’t affect anyone else â€“ now, the Internet is intergrated into and affects everyday society. Conversly, socielty is also the Internet. Rod recounted how, when visiting his business contacts overseas, he seldom meets any who regularly commute to work as travel simply takes too long and they are more than able to work remotely giving little to no consideration to the data they consume or the bandwidth they require to get their jobs done. In the US, peopleÂ perceiveÂ the Internet differently, the content is there and it’s there to be used â€“ there are no qualms about bandwidth orÂ usage. The goal of Pacific Fibre (@PacificFibre) is to put New Zealand and Australia on the same network as the US. It’s about content not infrastructure. We want to flood NZ with bandwidth, we want to put an end to the fear of using your devices to consume bandwidth. The problem with the current state of international broadband is it’s a huge ticket item putting it out of reach of the smaller players. Need to shake up the rate card. People will only spend a finite amount on content â€“ how do we unlock these content pools? We can’t take property rights away from SKY, but we do need to unlock the content. We need to combine bandwidth and content to bring perception of spend together. He relayed how, in the UK, regulation has forced Sky to send sport content down the pipe, while not calling for the same treatment of content suppliers in this market, Rod asked WHO is blocking these rights for content currently distributed (or not) by Sky, iTunes, NetFlix. There was aÂ briefÂ discussion surrounding maintaining the hygiene of the content pools and a call to turn off Â anonymousÂ commenting in publications such as the NBR (perhaps in response to recent commentary regarding Xero as a company). While I agree with Rod that this would at least put up a moderate barrier to those who enjoy trolling, there must be some provision for whistle-blowers to speak without the perception of being identified. The award (rightly so) went to Richard Naylor who in his usual limelight avoidance manner appeared on stage, accepted the award and walked off having to be called back to say a few words. This was a very data intensive presentation which I was unable to catch all the figures from but the information was all posted to the AUT World Internet Project page here. The World Internet Project is our best lens into the usage of the Internet in New Zealand. It’s based on a standard set of questions which don’t necessarily exactly fit New Zealanders, but in the interests of comparable stats across the globe the questions are what they are. Survey was based on respondents aged 12 years or over who were willing to invest ~35 minutes to take part in the biennial telephone survey. It is recognised that this is a source of reluctance to participate thus the survey tends to gain more acceptance from those specifically interested in relating their views. There has been a slight increase in overall usage crawling from 79% in 2007 up to 83% in 2009. 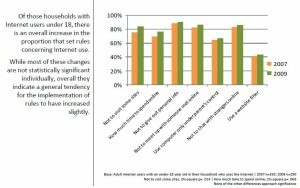 What was reassuring for me was the increase in awareness of the Internet and the desire to set guidelines and implement controls on usage by people under the age of 18. If you’re interested, contact the AUT Institute of Culture, Discourse & Communication to get involved in the discussion. It’s very important to have a statistically significant, and behaviorally relevant breakdown of how we as a nation are using this resource.